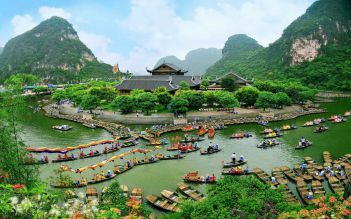 One day to discover Hoa Lu and Thung Nham bird garden is the best choice for those who are looking for a wonderful destination surround Hanoi but having limited time. 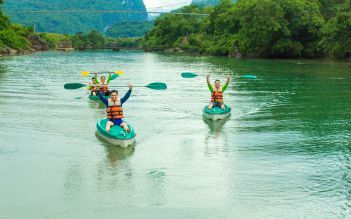 You will have opportunity to learn about the Vietnamese history by visiting Hoa Lu ancient capital and admire beauty of many kind of birds as well as natural landscapes in Thung Nham. 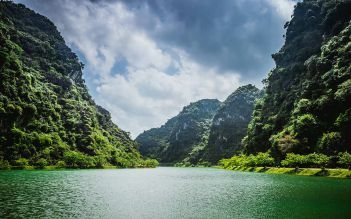 7.45- 8h30: We pick you up at your hotel in Hanoi Old Quarter & departure for Hoa Lu – Thung Nham There is beautiful roadside scenery on the way. Beautiful green park, nice to bike through. It was a rainy day, so the long cave and restaurant were a good place to seek shelter and have a bite to eat (recommend the fried rice with egg and fried corn, we loved it). Prepare to walk bend throughout almost the whole cave, it's very low. We didn't see many birds because of the rain and time of visiting. Would definitely come back here on a sunny day early in the morning or the end of the afternoon! Very interesting tour. Our guide was always ready to give us all the historical data. We were very warmly welcomed by our host family, and in the evening even invited to a family party, with everything that goes with it. Overall this was absolutely amazing. Let me first start by saying this is a physical tour with biking and hiking but not too tough (both my 70 yr old parents had no problems) The tour is limited to a max of 9 people (we had 5) which keeps it a more personal experience. The van was clean and the 2 hour drive was easy. Our guide, Fun, did an amazing job at keeping our trip tailored to our requests. The boat ride was awesome but the boat guide was a little pushy about the tip. The homestay was super clean and very comfortable. The food was amazing and all homemade. There is lots of biking which was fun but please bring 2 changes of clothes! There was lots of mud. Overall a huge fan of this trip and I would totally recommend it.